The little ones and I headed into school today to help out during the teacher appreciation luncheon. More specifically I'd signed up to watch Miriam's class during the luncheon and then we stayed for the rest of the afternoon because the kids really wanted me to. And by kids I mean my kids. I think Rachel asked me every single day this week if I would be picking them up after school on Friday and, if that was the case, if she could meet me in Miriam's classroom. 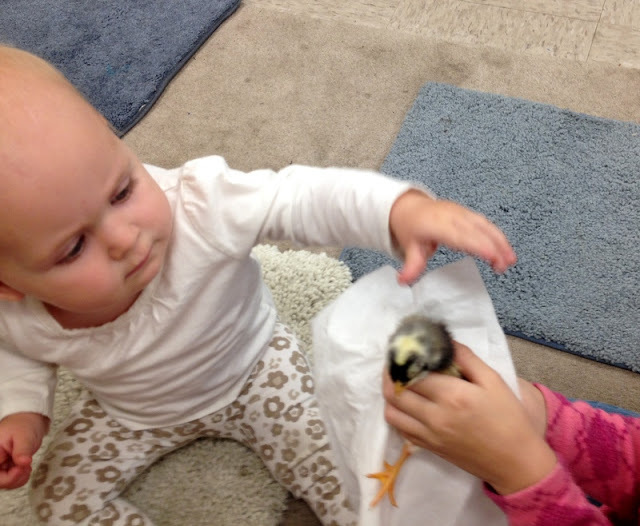 I couldn't figure out why she was so fixated on this scenario until I walked into the classroom and heard, "Cheep! Cheep! Cheep!" Miriam's teacher hatches chicks every year with his class. Sometimes, for variety's sake, he's able to score some duck eggs. Once he even got his hands on some peacock eggs! 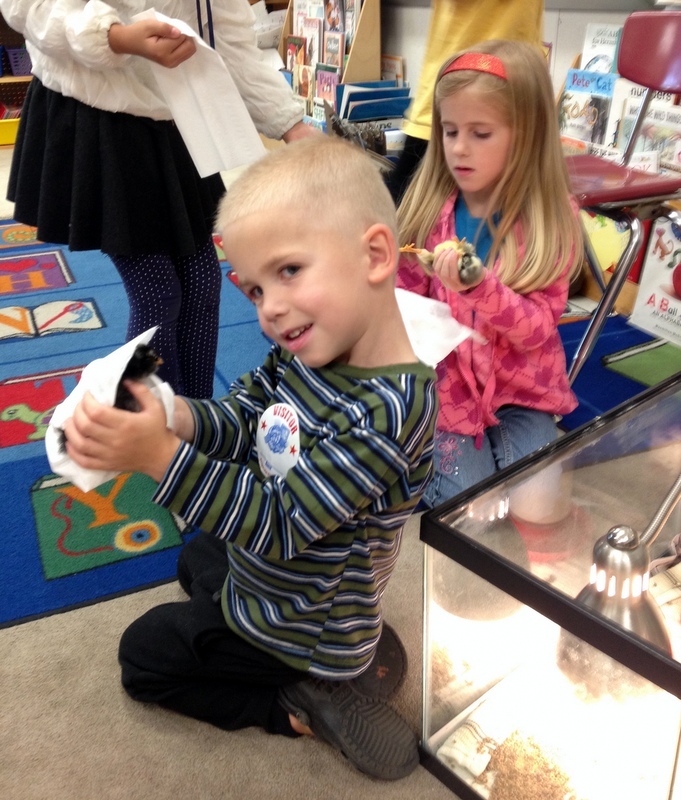 These particular eggs are the eggs of the chickens Rachel's class hatched. "So I'm basically a grandparent now," Rachel said. Anyway, she's been racing to Miriam's class to look at the chicks before class starts (and she has to be on the other end of the school) every morning this week, but so far Mr. A has not let the kids pick up the chicks because they were so new and he has so many visitors before school and isn't quite ready to supervise. But he promised Rachel that they could hold the chicks after school if I was there. So that's where her sudden desire to meet me in Mr. A's room on Friday afternoon came up. Honestly, I was rather exhausted from (surprise, surprise) an agonizingly long night with Zoë, and I knew that if I went home I would crash and not want to leave the house ever, ever again, so at the behest of my children I stuck around for the entire afternoon. And I even survived. 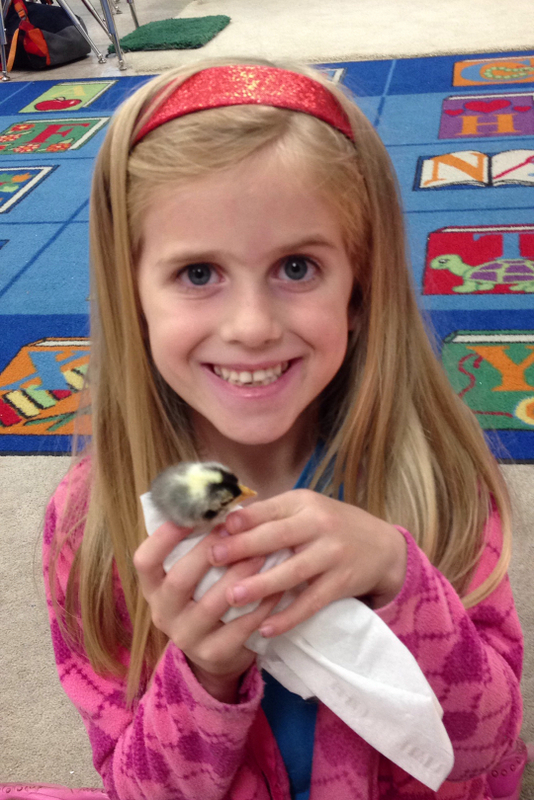 And Rachel came to meet us in Miriam's classroom and everyone got to hold chicks and there was much rejoicing. Sadly, I didn't get a picture of Rachel holding her "grand-chicks" because I forgot the camera and then my phone ran out of memory before she even got there. We'll be in to see the chicks again, I'm sure. 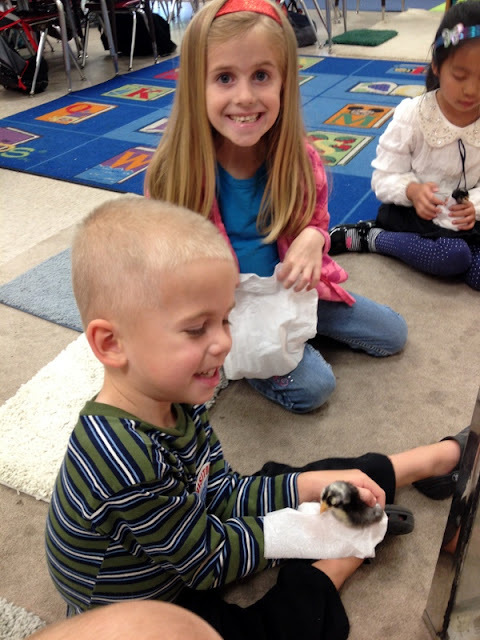 Everyone loves the chicks! All my children agree that it's the most wonderful time of the year. She was actually very excited about them. She spent a lot of time peering into their enclosure and shrieking at them. She was amazed every time one peeped or moved, which meant she was pretty much constantly amazed. She was quite a handful with the chicks, truthfully. I was running around like a chicken with its head cut off trying to keep all the babies safe! "Zoë! Don't lean on the small tank! You'll fall right in. Lean on the big tank over here." "Benjamin! Don't hold that chickie by its neck!" "Gah! Who left this chick on the floor!? Zoë's going to get it!" "Don't drop the chick in the tank. Set it down gently!" I can totally see why Mr. A hadn't let the before-school crowd handle the chicks yet. The after-school crowd was quite enough to manage and there aren't as many after school as before (mostly other teachers' kids...and mine). The whole school loves this unit so much though, so although it's a little bit stinky and a little bit stressful, I'm glad Mr. A does it year after year after year. Once we got home, though, I couldn't motivate myself to do another outing. We had Spring Fling at the kids' school and the YW Silent Auction at the church and we skipped out on both. I was too worn out to even pretend I could socialize this evening. Benjamin loves a good snuggle (turned-wrestle) in the morning and, for the most part, Zoë does, too. "To be their secretary? I don’t think so." What time is it? Pool time!